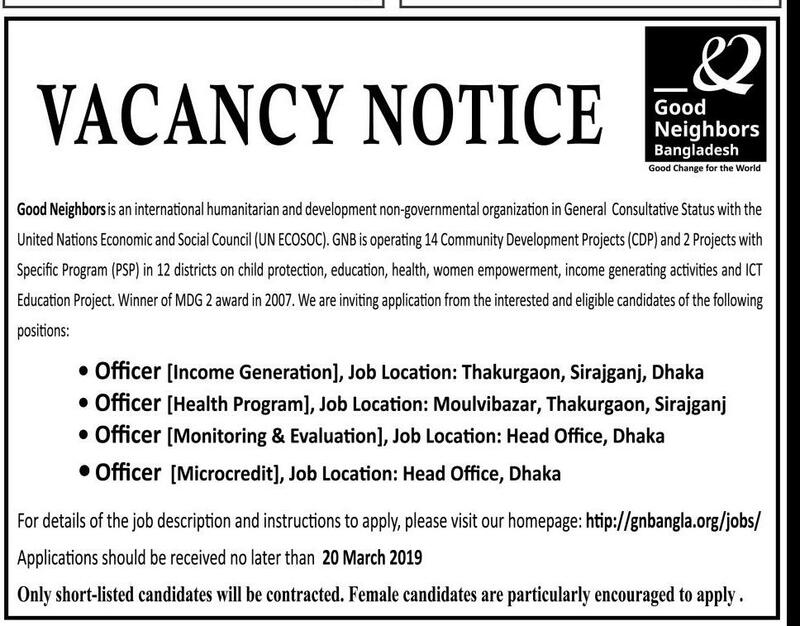 Jobs from Good Neighbors Bangladesh has been published..Hope you will get the truth and detailed news through us.Good Neighbors Bangladesh has circulated job circular in recent times.This is your chance to share your story and connect with job field in our country. As a hoping for a job, you’ll represent your skill and qualification. You can apply through online. Good Neighbors Bangladesh is a member organization of Good Neighbors International (GNI). It has been operating in Bangladesh since 1996 as an international non-government organization for helping deprived children, their mothers and families through education, health services, economic security, protection, community development, sanitation, and disaster relief projects.GNB is currently serving more than 21,000 children along with their mother and families through 2 urban projects and 12 rural projects in 9 districts in Bangladesh. Good Neighbors Bangladesh authorities published the notice for jobs in their team. Our Lekhaporabd Jobs team has converted the notification into an image so that you can download and read later. Below is a short summary and you can see the full picture of the notification below. To download the image, click on the image to save image or give a screenshot. Good Neighbors International is an international humanitarian and development organization with its headquarters in Seoul Korea, whose mission is to improve the lives of others – specially those of children – trough education, community development, health services, sanitation and disaster relief projects.As the recognition of the social development work, Good Neighbors received the UN ECOSOC general consultative status. In 2007 Good Neighbors also received MDG award for the contribution in Universal Primary education. GNI has carried out holistic development work in over 35 developing countries in the world since its inception in 1991.